I know they are kind of, well, quirky looking, but I just love buckwheats. Both of the species I put in my Dad’s garden bloomed for three months from late summer into fall. The Naked Buckwheat (Eriogonum nudum) displays it’s white pom-poms at the top of 2′ tall stalks, a minimalist display with a Dr. Suessian edge. 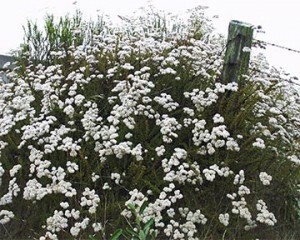 The airy quality of California Buckwheat (Eriogonum fasciculatum foliosum), with its hundreds of 1″ white blooms, reminds me of baby’s breath on steroids. California Buckwheat showing off its prolific flowering. I realize that they aren’t to everyone’s taste; buckwheats tend to be a little disheveled looking. Native right here in Chico – drive through Upper Bidwell Park to see them in the wild – they haven’t been refined by years of breeding to exacting standards of tidiness. They give a garden a free-wheeling character. Their beauty goes beyond their appearance. Both of these buckwheats are extremely drought tolerant, able to survive our long, hot, dry summers without supplemental water once they are established. And, they are both magnets to beneficial insects. I’ve counted five different kinds of native and honey bees at a time on a single plant. Tiny predatory wasps, the kind that protect gardens from harmful organisms, love the flowers, too. Watching the miniature wildlife flourishing on the buckwheats just plain makes me happy. Then, consider that these guys are virtually maintenance free. If you want, you can trim down the flower stalks after the blooms are spent in the late fall to tidy up your garden. Time required? A few minutes per plant. Use the California Buckwheat as a 3′ height background for smaller perennials or evergreen groundcovers. It’s fine texture will also contrast nicely with course-textured taller plants such as Eve Case Coffeeberry or McMinn Manzanita. The Naked Buckwheat’s verticality looks good in drifts behind shorter plants such as California Fuchsia and Bearberry Manzanita. If you judge the garden-worthiness of plants by more than whether they fit a traditional definition of beauty, you may find yourself loving buckwheats, too. This entry was posted in Uncategorized and tagged attracting beneficial insects, buckwheat, butte county native plants, california buckwheat, California native plants, drought tolerant plants, drought tolerant plants for chico ca, Eriogonum, garden design for chico ca, gardening with native plants, naked buckwheat, native bee plants, native wasp plants, predatory wasp plants, strange looking plants, unusual plants, white flowered plants on December 6, 2011 by admin.